Trainee advanced clinical practitioner emergency care Kyle Williams reviews Clinical Examination Skills for Healthcare Professionals. Now in its second edition, this practical guide offers excellent yet concise content thus making it highly accessible. 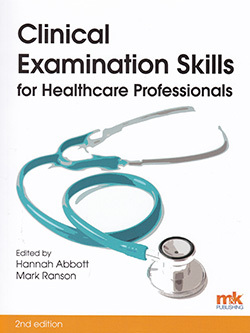 Including chapters on perioperative, obstetric and mental health assessments, the book offers readers an evidence-based and logical approach to conducting a clinical examination. Throughout, the book is well written and thoughtfully laid out and is supported by a range of knowledge from experts in their fields and current literature. Each chapter begins with a case study, which really helps readers relate content to real-life scenarios and encourage critical thinking. Furthermore, learning is supported by bullet points, tables, diagrams and mnemonics that help identify key information. Overall, this is a good resource and I would have no hesitation in recommending it. The depth of areas covered means that it will make it transferrable to a broad range of clinicians. It would be best suited to clinicians who are new to, or have an interest in, improving their clinical examination skills, and as a stepping stone between more thorough and established clinical examination titles.